What happened to my eggs? A fertility check can give you an indication of your egg store. Failure to ovulate (release an egg), poor egg quality or very few eggs are common reasons for infertility. We were born with over a million eggs, so what on earth happens to them all? This blog aims to demystify the story of egg production. On average, a woman releases between 400 and 500 eggs over the course of her reproductive life. Each month another egg is released, until eventually, no viable eggs remain and a woman experiences the menopause. For the vast majority of women, the supply of eggs nestled away in the ovarian follicles will be enough to ensure she does not reach menopause before the age of 45. For some women however, premature ovarian failure (also called premature menopause) means that their ovaries lose their ability to ovulate before they should. There are many possible causes of premature ovarian failure, including treatment for cancer and autoimmune disorders such as rheumatoid arthritis and thyroid disease. In most instances however, the precise reason remains unknown. 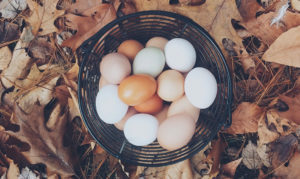 Whether the menopause occurs naturally with age or is associated with an underlying condition, the principal cause (a lack of viable eggs), remains the same. When did we get our eggs? It is an amazing thing that as a baby girl develops in the womb, she already has every single one of the eggs from which her own future children will be conceived. The number of eggs originally present in the ovaries is not 400-500 however, but closer to six or seven million. At just half way through pregnancy, 20 weeks before a baby girl is even born, the number of immature eggs in her ovaries peaks at this staggering figure. Each egg is housed within an ovarian follicle, which provides the environment and hormones needed for the egg to mature later in life. From this point onwards however, the number of follicles begin to decline. By birth, around one or two million eggs remain in the baby girl’s ovaries, and by puberty, this number has dropped to a few hundred thousand. The process via which follicles are lost is called atresia. Essentially this means that the follicles degenerate and die over time. The loss of these eggs does not result in a menstrual bleed, because the eggs died inside the ovary and were never released to travel into the uterus. Instead, the follicles are broken down by natural processes and the components are reabsorbed by the body. It is often thought that each month, only one follicle begins to grow in preparation for the release of one egg. In actual fact, follicles are ‘recruited’ from the resting supply nearly a year before and then undergo about three months of growth and development before ovulation. At the start of each month, there are around 15-20 follicles which have made it to the final stage of this process. Under normal circumstances, only one of these 15-20 follicles will become dominant and finally release an egg. By day 8 of the cycle, the follicle that has responded to naturally produced follicle stimulating hormone (FSH) the most can be seen on the ovary using an ultrasound scan. This is the follicle that is likely to continue development and ovulate as it happened to be exactly the right size at the right time. During IVF treatment, FSH injections are given so that levels of the hormone remain higher for longer. This means that multiple follicles are able to mature at the same time in preparation for egg collection. It is important to mention that the rate at which follicles are lost through atresia cannot be altered by preventing ovulation. Using the contraceptive pill does therefore not mean you will remain fertile for longer. Follicles will continue to be broken down and reabsorbed in the ovary regardless of whether an egg was released during the cycle or not. After the age of 35, the quality of the remaining eggs starts to decline and so the rate at which follicles degenerate and die begins to accelerate. Chromosomal abnormalities increase with age because the proteins responsible for quality control are lost over time. Over the next ten years, less and less follicles are recruited to begin their three months of growth and development. This means that the likelihood of there being one follicle which can become dominant and ovulate is reduced each month. At the menopause, there are around 1000 follicles that remain in the ovaries. Whilst this may sound like a plentiful supply, these follicles are generally unable to respond to FSH and therefore cannot ovulate. FSH levels become high at the menopause, because other substances which would normally be released to control the hormone are no longer produced. So from a peak of six or seven million, we are left with a mere 1000 follicles which are unable to release a fertile egg. Although the age at which women experience menopause is highly variable, it is likely that those women who started out with higher numbers of follicles will experience the menopause later. Having said this, there are a number of other factors which can influence the health of the ovaries and therefore the ability of follicles to successfully ovulate. Unfortunately, receiving chemotherapy can have a permanent effect on fertility by causing high FSH levels (as seen in the menopause) and preventing follicles from maturing. Women who have not had children or who would like to have more children should therefore speak to their doctor about fertility preservation before beginning cancer treatment. Smoking reduces the blood flow to the ovaries and is known to increase the rate of atresia. Quitting smoking is therefore advised for any woman trying to conceive. Maintaining a BMI between 19 and 25 can not only improve your natural fertility but can also help ensure you have a healthy pregnancy. Women with a high BMI can find it harder to get pregnant and are at greater risk of developing polycystic ovary syndrome (PCOS). The cysts in PCOS are in fact small follicles, but these never grow or reach full maturity. Equally as damaging to fertility is a very low BMI, which can cause irregular cycles and prevent ovulation altogether. For women receiving fertility treatment, a higher BMI means more drugs need to be given and the eggs produced are often found to be low in number and quality. The egg collection procedure is also more difficult in women with a high BMI, because it can be harder to obtain clear images of the ovaries and the follicles using ultrasound. Furthermore, there could be risks when administering anaesthesia and finally, the incidence of miscarriages and complications in childbirth is higher in women with a raised BMI. Regular exercise enhances blood flow to the internal organs and also helps maintain a healthy BMI. This ensures there is an ideal balance of circulating oestrogen and FSH at key stages of the cycle, providing optimal conditions for successful ovulation and fertilisation. Tests for both FSH and anti-mullerian hormone (AMH) which measures the woman’s ovarian reserve and gives an indication of the number of eggs left – are available from Bourn Hall either individually or part of the Fertility+Wellbeing Check. Find out more about our Fertility Health + Wellbeing test here. Information about fertility preservation including egg freezing.